I never would have thought I'd be much of a scarf girl. But this fall is proving that to be oh so wrong. So cheers to the first DIY scarf of the season. Expect a lot more to come your way. Gather: Large plaid button up (I found mine in the Men's section at a local thrift store), bleach, spray bottle, sewing machine, scissors. 1. Begin by laying out the shirt flat on the ground. 2-3.Then, cut off the bottom of the shirt, making one long strip. Mine was about ten inches wide. Next, sew the two ends together, making an infinity scarf. I only sewed the ends together because I wanted the rest of the hem to fray, but if you want a cleaner look, try hemming a lining on the back. 4. Lastly (not pictured), lay your scarf flat in an area that you won't mind getting bleach on (I chose the bathtub) and with a spray bottle, spray splotches of bleach in various places on the scarf. Wait 20 minutes, flip the scarf over and repeat on the next side. Once both sides have completely dried, hand wash and air dry your scarf. 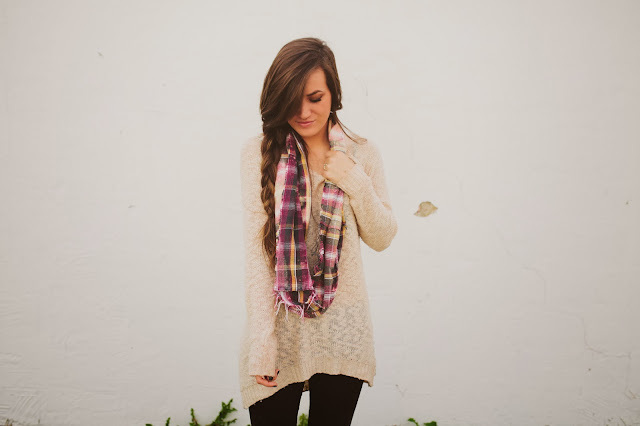 This looks perfect for autumn, love it. awesome DIY! The bleach and frayed edging is a great touch! What a cute fall idea! I love the way you added texture to that! 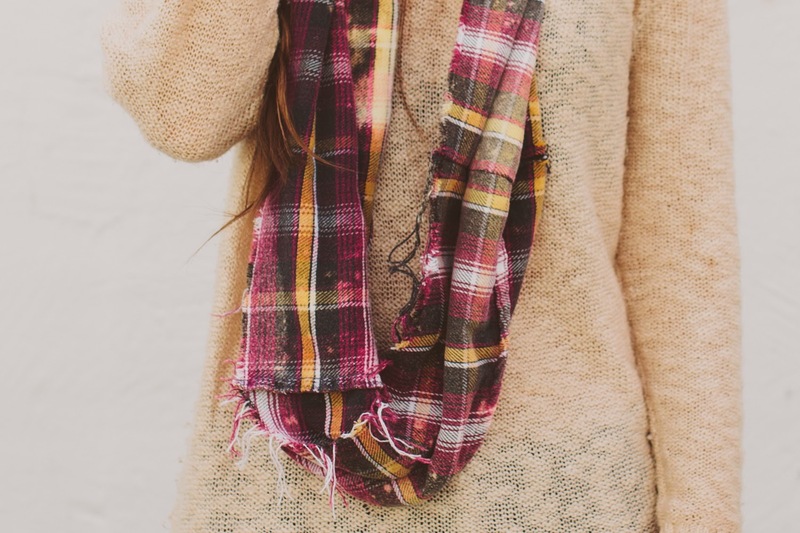 Plaid shirts are my favorite and I would love adding a plaid scarf to my closet as well! Oh so so perfect for fall! I adore this! Oh I love this! The bleach makes it look so unique. I might actually do this to some scarves I already own. Awesome idea. It's a great idea. Smart girl! I'm afraid I can't do this well, I'm not good at handwork. This is such a good idea, I have a shirt I can totally do this with! I'm so excited to try it out! The scarf looks great; excellent diy! such a good idea and the colours of the used to be shirt are so lovely! 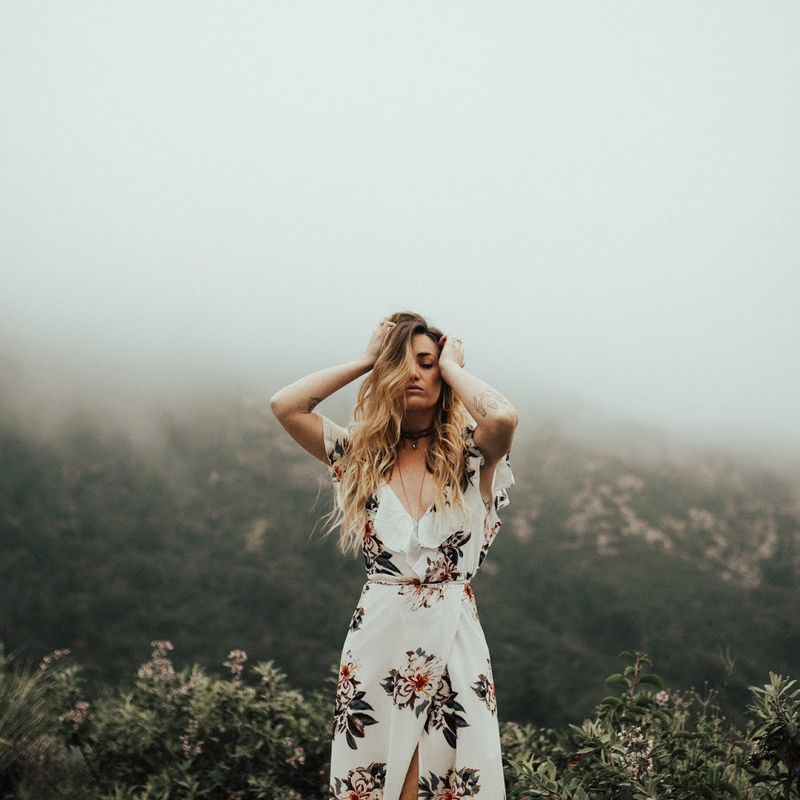 I just discovered your blog and your pictures are simply lovely! Also, great diy! I'm going to have to try this. 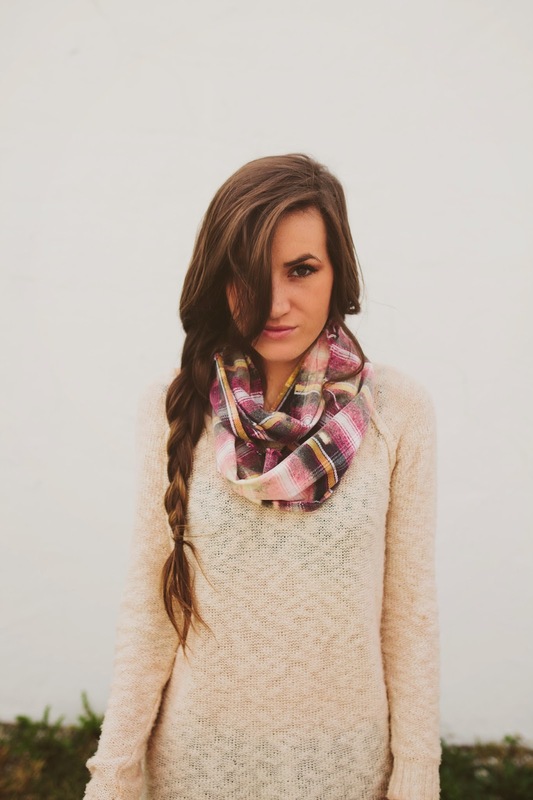 Tis the season for scarves! What an easy, inexpensive idea! This is perfect in so many ways... a great DIY christmas gift, a fun & easy DIY to do with your teen daughter who is so into fashion, the infinity scarves and friends... so a great way to create a little mom time. Love it! Awesome idea! a super easy DIY! 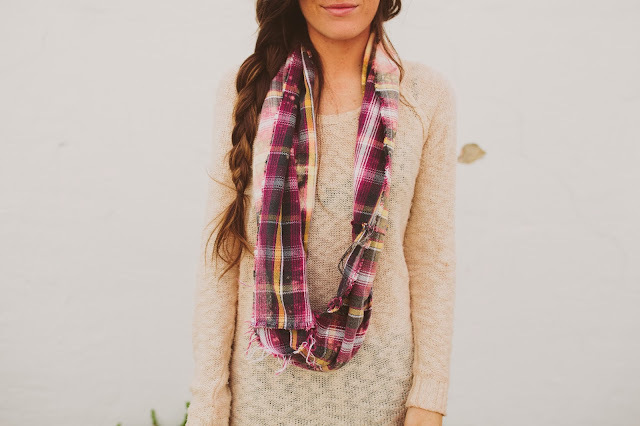 Tis the season for scarves... perfect timing! A inexpensive DIY for christmas gifts, and a fun way to create a little mom time with teenage daughter who is so into the infinity scarves, friends & fashion! Go Kinsey!